What exactly are Baby Boomers? The term “Baby Boomers” refers to the generation that was born worldwide between the years of 1946 and 1964. Currently, there are over 74.9 million Baby Boomers living in the United States, making up for 50% of the US population. It may take you by surprise, but the sprightly 55-year-old you currently share a desk with is actually a member of the tail end of the ‘Boomers. This generation is still hard at work, but in 15 years, these go-getters may start entering the public and private healthcare sector. Here are the statistics you need to know to prepare for this influx TODAY. The Senior population is now the largest & fastest-growing segment in the United States. 47 million seniors over the age of 65 live in the United States. This generation Influences everything from consumer behavior to healthcare costs. They have a direct effect on supporting categories including clinical and administrative services, healthcare labor, supplies, technology and purchasing. 100 million residents will be aged 65+ by 2020. All Baby Boomers will be older than age 65 by 2030. 78 million people will be 65+ in 2035. Firstly, it’s important to recognize the crucial new role technology plays in the healthcare sector. 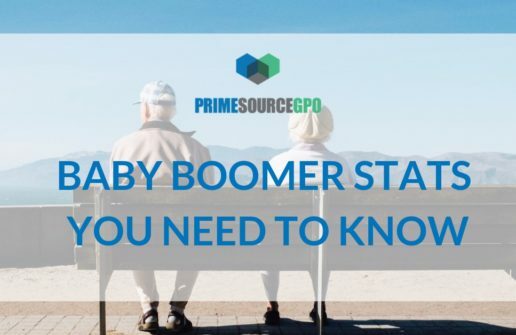 By keeping your internal systems up-to-date, and leaving plenty of room for adjustments in the future, you can ensure that the Boomers you’re catering to now – and will be catering to in the coming decades – recognize that your facility has the technology to support their needs. Secondly, preparing your facility, warehouse, agency, etc. for the “Baby Boomer Invasion” is not a simple, 5-year project. Advanced preparation is crucial. When planning for the years to come, keeping these statistics in mind will help your team make more educated decisions about investing for growth. Prime Source GPO is the premier Group Purchasing Organization for companies and organizations who believe in a permanent growth mindset. Do you count yourself amongst that number? Stay tuned for more updates to the Prime Source GPO blog on this topic!